Focusing on the here and now can be successful for short-term business success, but may leave business owners without proper plans for the long term. Everyone is busy. Business owners are no exception. In fact, according to a recent market study conducted by the Principal Financial Group®, 47% of business owners indicate with the day to day challenges of running a business, they’re either too busy, not sure where to start, or it’s not ‘top of mind,’ to financially prepare for the future. Like many Americans, business owners live in the here and now. They respond to what’s at hand, what they know, what they enjoy. That focus can be successful for short-term business success, but may leave the business owner without proper plans for the long term. Having a holistic and long-range view is critical to ensuring a business and its owner are properly protected — regardless of what happens. A couple of areas owners should look at include succession or transition planning, as well as protecting against unexpected events such as premature death and disability. Business owners need your help taking action with their financial strategies. In my experience, advisors have the most success when they stop pushing product and instead listen to clients’ concerns. They then can recommend financial solutions that help fill a gap or deal with a pain point/area of concern. It can be a journey and an evolution, but results in the client being more engaged and inclined to take action. How do you get clients’ attention? Business owners have a lot of priorities and audiences to consider when making financial decisions and it can be overwhelming. As a financial professional, one of the easiest ways for you to start the conversation is to offer complimentary financial reviews. These types of reviews help show gaps and identify next steps. Business protection, yet less than a third of them have solutions in place. Income protection, although only 26 percent have individual disability insurance. Health and wellness solutions, with over half offering these. Having a good understanding of business owners’ priorities can help create opportunities with existing clients and prospects. 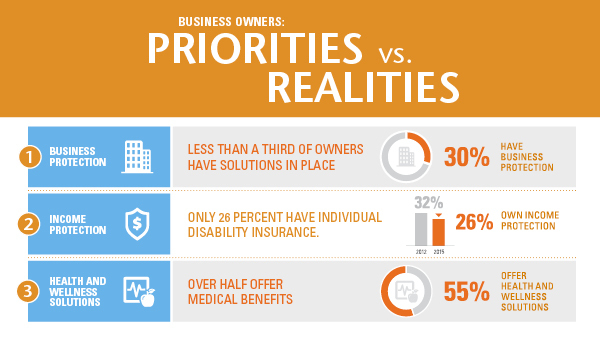 Learn more in the full business market owner study, A Disconnect between Priorities and Action. 1 2015 The Principal Financial Group® Business Owner Market Study, conducted by Harris Poll.